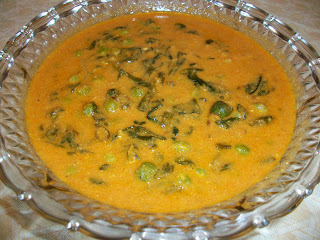 Methi and mutter cooked in tomato gravy..this is not cream based curry.This curry is little tangy and spicy ,without cream it tastes gud but if u want u can add cream also,its additional and optional.In my curry i ididn't add any cream . 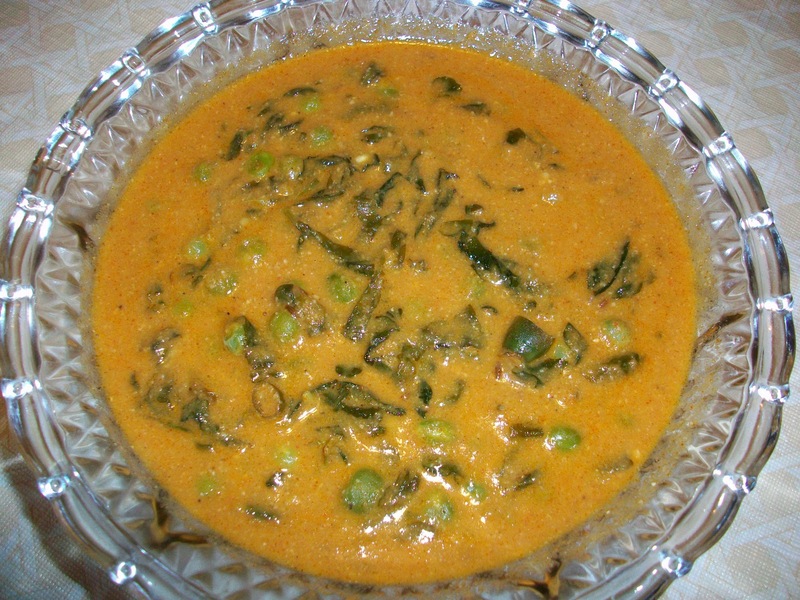 Wash methi leaves and soak it in water with little salt until u add this to curry. (this will reduce the bitterness). Grind tomato,soaked cashew nuts and ginger to a smooth paste. Heat oil and butter in a kadai,add cumin seeds when it splutter add green chillies and fry it. Then add the grounded tomato paste and cook in medium heat n keep stirring. when oil starts separating,add all the dry powders and mix well. Stir fry the masala till it get thick and dry. Then add thick curd mix well and fry for 2 minutes. Now add about 1 and 1/4 cup water,enough salt and stir well. Then add the peas stir well and cook covered for another 3 minutes. and add drained methi leaves and stir well and simmer for another 2-3 minutes. 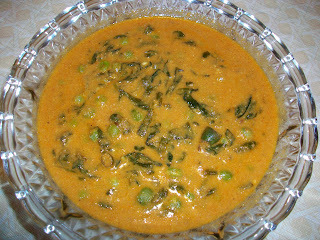 Now the tomato methi mutter curry is ready and serve hot with any Indian breads. Note:U can avoid green chillies also,but it gives gud flavor when fried in oil n butter. Luv this yumm Muttur Methi Curry Dear.Tasty Combo.Luv it.